This Belleek clock has been re-introduced from the archives in 2012 to commemorate the 155th anniversary of the Irish pottery. The Belleek anniversary clock was originally produced in 2000. The Belleek clock takes its design from the neo-classic style of mantel clocks produced in the 18th Century, the golden age for the creation of such elaborate and stylish timepieces. This clock is a limited edition of 450. Each one has a special back stamp and will be individually numbered. The Belleek clock is crafted of fine china that is enhanced with hand-painted gold accenting along with an embossed design. The Irish mantel clock measures 8 3/4" wide x 10 1/4" tall x 3 1/3" deep and it is handmade and hand-painted in Belleek, Ireland. 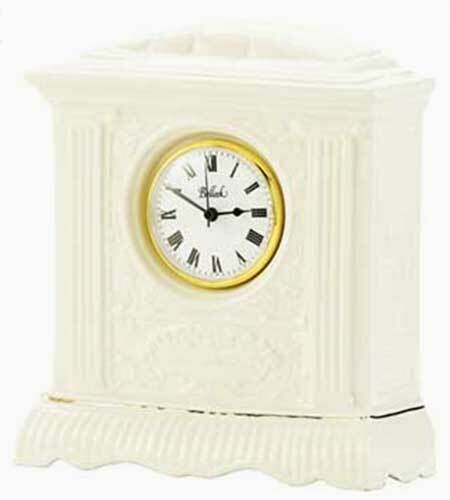 The Belleek clock is gift boxed, complements of The Irish Gift House.